NOTE: H.U.B.E.R.T. 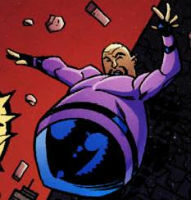 created by Erik Larsen, with help from Keith Giffen and Victor Bridges. H.U.B.E.R.T. was one of the many cast-offs of Johnny Redbeard. He joined up with some fellow rejected freaks to become the Throwaways, a team of relatively little skill who were arrested by Freak Force. This caused them to be sent to the M.M.M.S. slave camp for criminal super-freaks. Many years later, many of the Throwaways began working with the Fantastical Force, also former creations of Redbeard. These villains were confronted by a reformed Freak Force but unfortunately for them, the murderous Billy Berman Mighty Man was amongst the heroes’ ranks. He slaughtered all of them without mercy, H.U.B.E.R.T. included.